Happy Friday! Some of you only have a three day weekend coming up. Not me, so I don't want to hear about your fun plans. I'll be at work. Sigh. Here are all the Rachael Ray posts around the blogosphere that I found this week. 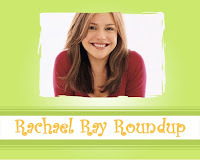 If you write a post about Rachael Ray, let me know about it so I can include it in the Roundup. You can e-mail me at everythingrachaelray@gmail.com. Have a wonderful weekend! What would it be like if Anthony Bourdain had a blog? Awesome. He's a guest blogger at Michael Ruhlman's blog and he has something to say about each and every Food Network star. Finally, someone in the media who is not a Rachael Ray basher. Angie Fenton of Louisville Courier-Journal says this about Laura Bush's visit to Rachael Ray's talk show: "Success may be the sweetest revenge, but having the first lady spontaneously appear on your afternoon talk show has to be worth something too." Glitterati Gossip has tons of pics from Katharine McPhee's appearance on The Rachael Ray Show. Bug n' Belle offers another recipe review, this time Chicken Divine from Express Lane Meals. It qualifies as another winner. Rachel at Rachel's Bite went international this week with Rachael's recipe for Salt & Pepper Tofu with Chili-Soy Sauce and Red Rice with Chorizo. She also spoiled her doggies by making Potted Sweet Potatoes, Carrots and Chicken for them. Jacob at Food Network Addict has more pictures of Rachael Ray from the Hearth Truth Fashion show (and Kelly Ripa too, just for fun). Katerina at Daily Unadventures in Cooking got inspired by Rachael's recipe for Gemelli with Roasted Red Pepper Sauce and tweaked the recipe to make Roasted Red Pepper Linguine with Prawns. Cate at Sweetnicks tried Rachael's Twist-a-Ronis and love love loved them. Another sucess story resutling from being mentioned in Every Day with Rachael Ray - Ron & Frank's Gourmet Drink Mixes was picked as Best Oddball for its Peanut Butter Cup hot chocolate mix when the magazine tested hot cocoa mixes.